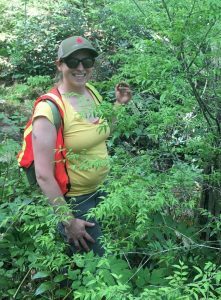 The Hemlock Restoration Initiative of WNC Communities is proud to be a host-site for AmeriCorps Project Conserve. 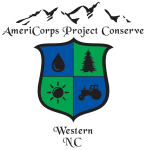 Project Conserve is a National Service program founded in 2004 as an initiative of Conserving Carolina, formerly Carolina Mountain Land Conservancy (CMLC), to respond to the growing conservation needs in Western North Carolina. We were so fortunate to have Sara deFosset set the bar as the first AmeriCorps member to serve with the HRI in 2016-2017 as our Outreach and Volunteer Engagement Associate. A native to North Carolina, Sara grew up in Chapel Hill and earned her BA in Global Studies and Sustainable Development at New College of California in San Francisco. During her studies, Sara began a career in the landscape and nursery industries and developed a deep and enduring fascination with human relationships to plant systems, ecology, and the built environment. Sara continued her education by completing an MA in Sustainable Development at the University of California Santa Barbara, where her research examined the ways in which integrated agricultural practices, like agro-forestry, could be used meet development goals like reductions in poverty and improved environmental sustainability. Sara’s contributions to the HRI have been tree-mendous! She came into the position with a strong set of critical thinking skills and a voracious appetite for learning about every aspect of the issue of hemlock loss due to the woolly adelgid. She has a knack for synthesizing this information into terms that resonate with people. Sara has been a great “face of the program,” allowing the HRI to have exponentially more meaningful interactions and connections with the public. 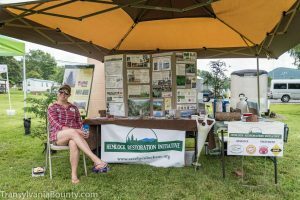 Using her savvy customer service skills, she responded quickly and thoughtfully to landowner requests for information, instruction, and guidance on how to treat their own trees. She has also been able to create new content to explain the value of the work we are doing to a variety of audiences and in different formats. Not only that, but her dedication to the cause extended out into the field, where she repeatedly scrambled up and down steep slopes to lead crews in hemlock treatment. 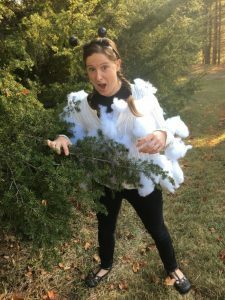 She even dressed up like a woolly adelgid to better understand their feeding habits through role play! We are very excited to have Thom Green join us as the Stewardship and Volunteer Engagement Associate for the 2017-2018 Project Conserve term! Thom was born and raised in Portland, Oregon, where he developed a love for forests and helping other learn about and connect to the natural world. After earning a BA in Philosophy and the History of Science and Mathematics from St. John’s College in Annapolis, Maryland, Thom returned to Portland to work as an environmental educator. 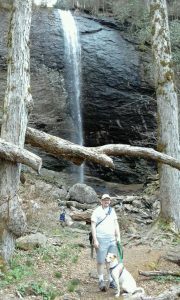 He moved to western North Carolina in 2014 to study forest ecology and earn a Master’s degree in biology from Western Carolina University, where he came to love the region’s mountains. 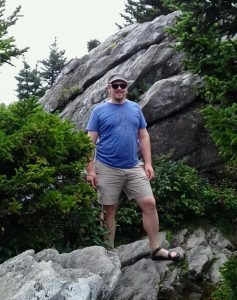 As the AmeriCorps Stewardship and Volunteer Engagement Associate with the Hemlock Restoration Initiative, Thom is excited to bring together his background in science and connecting people with nature in order to help conserve the forests of western North Carolina. He is looking forward to engaging the local community in learning about and protecting their forests. We are looking forward to learning from Thom and to expanding our current program offerings by bringing him on board!